Contractors and consumers can rest assured that their NATE-certified technicians have the knowledge needed to provide excellence and quality service. Certification for technicians within the heating, ventilation, air conditioning and refrigeration industries. 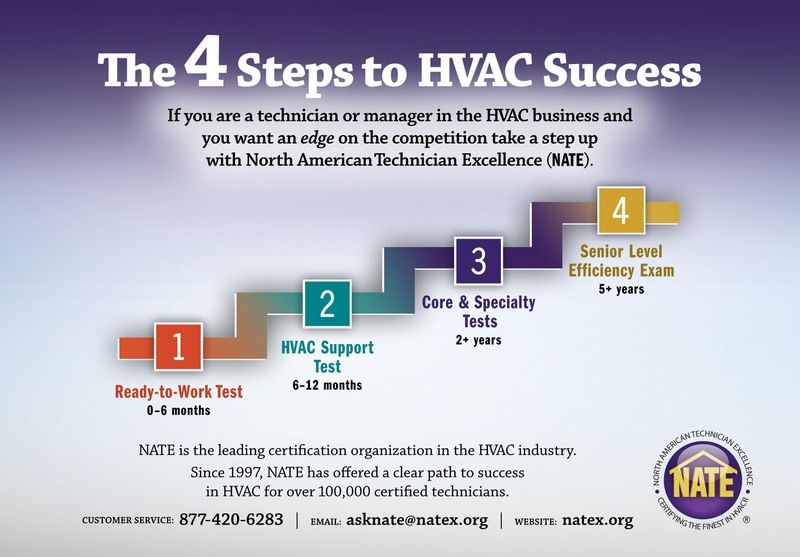 NATE is the largest nonprofit certification organization for HVACR technicians in the United States. NATE partners with industry professionals, including contractors, manufacturers, distributors and educators to develop and recognize knowledgeable, competent and professional HVACR technicians. NATE tests are developed by a nationwide committee of industry experts and represent real world working knowledge of HVACR systems. Click here to learn more about these steps and the exams offered by NATE.